Community workshop at Age UK Stafford with Day Centre visitors creating beautiful glass coasters full of colour. I have some news I cannot wait to share with you all. For now, my lips are sealed but it won't be long till I can let you know. To celebrate this news I will be running a giveaway competition via social media. So be ready for your chance to win you won't need to do much, just like, share and comment on my posts. Spreading the news by sharing, liking and commenting is really helpful for small businesses like mine. So simple yet so very helpful. To be sure you get to hear my exciting news please make sure you're following me on social media, Facebook, Instagram, Twitter and LinkedIn. If you haven't already please sign yourself up to my mailing list by clicking here. So excited this is going to be great, your going to love it. On Location at Existent's Office in Lichfield to photograph my sculptural vessels on some wonderful contemporary furniture. It is nice to be able to see the works in situ in this way. I hope these images will enable you to see how these pieces would sit in your home or office. The reflections and glows of these pieces are so difficult to truly capture. It is lovely to have them shown on other surfaces than that of my photo studio. Light refracting and reflecting making these sculpture appear like crystal and diamonds. With special thanks to Paul for allowing Jacqui and I to use the Existent office to photograph my new collection of works. 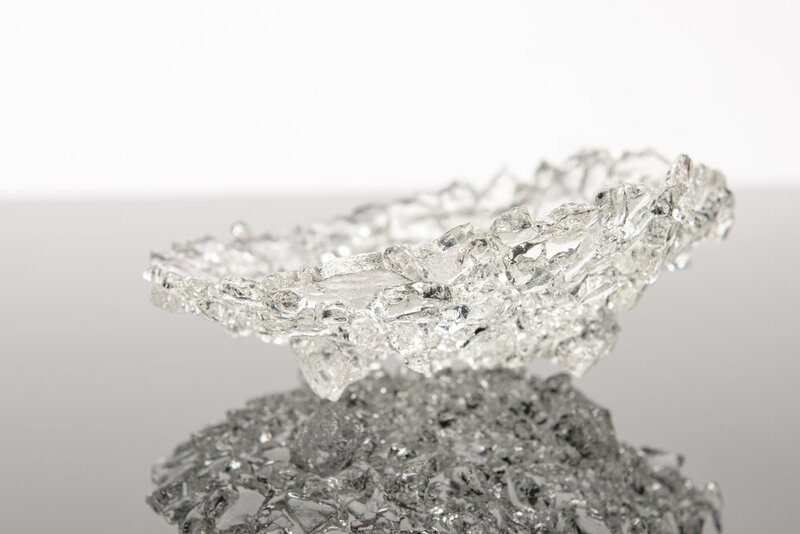 Online exhibition with Contemporary Glass society to which my 'Shards' piece has been selected to be shown. The theme of this exhibition is Destruction/Construction. This theme is apt to my practice as I explore these very elements through my work in physical and mental terms. Broken glass (frit) is used in all of my works. The idea being that broken can be beautiful and strong once again.